Potatoes and carrots cook with the beef, making this recipe a quick one to prepare. Then just let it roast until it's done. The creamy sauce comes together in minutes. Preheat oven to 375 degree F. Lightly oil a large heavy roasting pan. Toss potatoes with 1 tablespoon oil and 1 teaspoon salt; place in one side of pan. Toss carrots with 1 tablespoon oil and 1/2 teaspoon salt; place in other side of pan. Rinse and pat beef dry. Season with pepper and remaining 1 tablespoon salt. Heat remaining 1 tablespoon oil in a large skillet over moderately high heat and brown beef on all sides, about 5 minutes. Place over carrots in pan. Roast 20 minutes. Reduce oven temperature to 350 degree F and roast, stirring potatoes and carrots, until beef is fork-tender, about 2 hours more. Transfer beef in pan to rack; let stand 15 minutes before carving into 1/3-inch-thick slices. Meanwhile, whisk horseradish sauce and heavy cream together in a small bowl to soft peaks. Salt and pepper to taste. 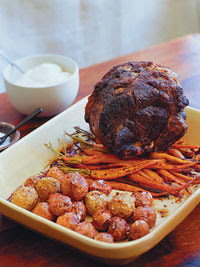 Transfer beef, potatoes, and carrots to a platter; serve horseradish cream on the side. Makes 6 servings. Calories 920, Total Fat 65.5 g, Saturated Fat 25.5 g, Cholesterol 205 mg, Sodium 1337 mg, Carbohydrate 36 g, Fiber 6 g, Protein 47 g. Daily Values: Vitamin A 0%, Vitamin C 0%, Calcium 0%, Iron 0%. This entry was posted on 10:38 PM and is filed under Beef . You can follow any responses to this entry through the RSS 2.0 feed. You can leave a response, or trackback from your own site.